The Pentax PF-65ED II scopes are a relatively recent release from Pentax, modifying their old 65-mm scope line with improved glass and coatings. 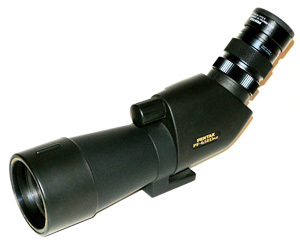 These scopes are available in angled and straight versions. The one we received for review was an angled version, but much of what we have to say won't be specific to just the angled type. With the 20-60x XF zoom eyepiece, the straight version is $819.00 while the angled version is $876.00 . So, one of the first things to call to your notice is that here are high-quality, ED-glass scopes for well under $1000. We trust you are paying attention now! One distinctive feature of the PF-65 scopes is their compactness. The PF-65ED II angled scope with the XF zoom eyepiece is just 12 inches long, and weighs about 45 oz. with the eyepiece. A scope this small can be put on a lightweight tripod and still be very stable, so that the weight of the entire unit can be kept quite low. This compact scope easily fits into a backpack or carry-on luggage and travels very well. The prism housing is encased in black rubber armoring that matches the color of the barrel and eyepiece. These scopes come with a focus knob, as opposed to a ring. The scope rotates within a ring that attaches to the tripod mounting bracket, with nice stable detents for positions 45° and 90° off vertical. The shape of the prism housing and its proximity to this ring prevent it from being rotated any further than 90° in either direction. Like their bigger brothers, the PF-65ED scopes use eyepieces with a 1.25-inch American astronomical standard mount, which means any such telescope eyepiece will also fit a Pentax scope. 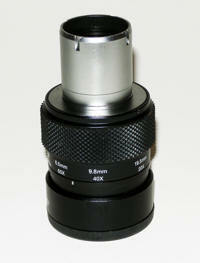 The eyepieces lock into place with a clockwise 1/4 twist of a collet on the outside, a mechanism that is quick and easy. The main body of the scope is O-ring sealed whether or not an eyepiece is in place so you need not worry about changing lenses when it’s raining. In keeping with the smaller size of the scope, Pentax has re-designed the eyepieces to be smaller and lighter. In addition to the 20-60x XF zoom eyepiece, there are the XF8.5 and XF12 eyepieces available, which provide fixed magnifications of 46x and 32.5x respectively. The eyepiece comes with a twist-up eyecup. While the eyecup position does not lock in place, the movement is smooth yet firm so that all positions are stable. The rubber end of the eyecup is beveled to increase user comfort. The eyecup end can be screwed off when adapting the scope for digiscoping (see below). We found that the effective magnification range of the zoom eyepiece was really only from 20x to about 55x; higher than that led to notable deterioration of image sharpness and brightness. This is not unusual for zoom eyepieces, especially in smaller objective scopes. We've noted the same phenomenon on some 80-mm scopes. The PF-65ED II scopes have a focal range of 16.4 feet to infinity, and a field of view of 117-51 feet at 1000 yards, across the 20-60x zoom range. This is actually a comparatively wide field of view for a scope of any size. The view through this little 65-mm scope was impressively bright. At 20x, the PF-65ED II was notably brighter than at least one 80-mm ED-glass scope we compared it too. We noted no color bias at all - bright white objects remained bright white. The centrally-positioned focus knob is about an inch long. The focus mechanism is comfortably stiff and very precise to use. Typical of other Pentax scopes we've looked at, the focal mechanism is quite shallow - it takes many turns of the knob to go from minimum close focus to infinity. The relative stiffness of the mechanism keeps it from being knocked off focus easily, which is a plus. Overall, we were quite impressed with the image quality of the PF-65ED II scope, and the general ease of use of the design only increased the pleasure in using it. Like most optics companies that also make cameras, Pentax did not originally provide much in the way of digiscoping adapters, especially for cameras by other manufacturers. Hidden under the rubber portion of the eyecup, however is a little gem in the form of a 43-mm thread that can be used to attach cameras with filter thread capability. If your camera's filter or lens accessory adapter is a different size, a step-up or step-down ring will do the trick. This is the preferred attachment method, as the eyepiece and the camera lens are aligned, preventing positional vignetting (shadows around the outer part of the image created when the light entering the lens is off-center), and is the only way to attach a digital single lens reflex (DSLR) camera. For those with point-and-shoot cameras that do not have the ability to accept screw-on filters or other accessories. Pentax now offers the UA-1 Universal Camera Adapter ($71.00) . The adapter attaches to the scope with a clamp that tightens around the eyepiece mount collet, and to the camera with a tripod mount screw. The platform lets you swing the camera out of the way when you want to view through the scope and back in when you want to take a photo. 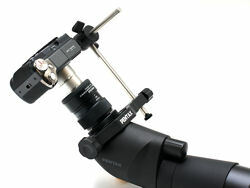 The pivot rod adjusts to accommodate cameras of different heights and depths. As with most platform camera adapters, there is a drawback: the screw that attaches the camera to the platform is free to slide when you remove the camera to change a memory card or battery. This can be remedied by using the Manfrotto 323 Rapid Connect Assembly ($2,450.00) to attach the camera to the platform. The socket portion of the assembly will keep the camera position stationary and the rapid connect plate can be removed to allow access to the bottom of the camera. The objective lens cap is a nifty double spring-loaded design that fits snugly and is difficult to dislodge accidentally. The lens cap for the eyepiece is a hard rubber cap that fits snugly on the rubber portion of the eyepiece so that it doesn't dislodge too easily - it actually works surprisingly well. Pentax built a raised ridge onto the extendable lens hood, presumably to aid in sighting on things to be viewed. This device is covered when the cordura scope case (that is included with the scope at no extra cost) is used. The case itself fits very snugly over the scope and provides minimal padding for its protection. A separate flap over the focus knob attaches by Velcro strips to the main portion of the case on either side, allowing the flap to open in either direction (or be removed) for the comfort of left- or right-handed users. On the objective end, the case is loose enough for easy deployment of the lens hood, which is good. The end of the case zips open, but lacks a mechanism for fixing the flap in place, which is not so good. On the other hand, this reinforces the fact that you should use the lens hood, since the hood holds the flap open and out of the way! Inside the end of the zipping flap is a pocket in which to place the objective lens cap, which is very good, since this also adds weight to the flap, thereby minimizing its tendency to blow in the breeze. Summing up, we really liked pretty much everything about the Pentax PF-65ED II scope. First and foremost, the image quality is very good. 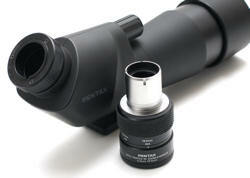 The compact dimensions make carrying this scope a breeze, while its rational design makes using it simple and intuitive. All these features at this low price make the affordability of this little ED scope as impressive as the performance.